He’s best known as a filmmaker, of course. Wings of Desire, The State of Things, and Paris, Texas. Wim Wenders has made more than forty films – mainly feature films and documentaries. He’s won international cinema awards by the truckload. 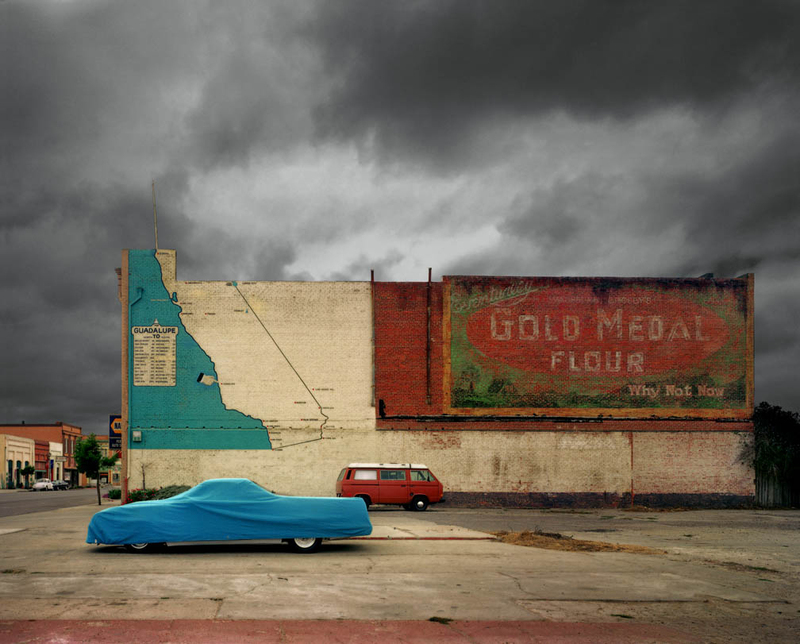 Wenders is also a skilled photographer with an idiosyncratic approach and a distinctive point of view. He’s published several photography books that have been well-received internationally. But I’m not going to write about any of that – with the exception of one film and one photography book. 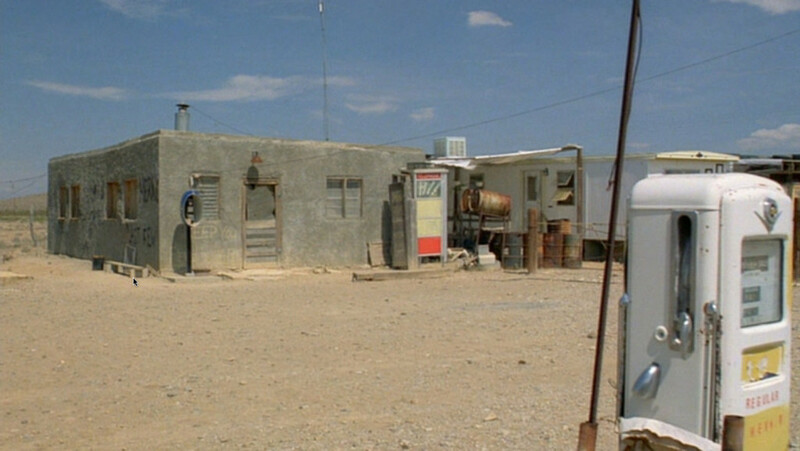 The film is Paris, Texas; the photo book is Written in the West. But first let’s start with a few facts: Ernst Wilhelm Wenders was born in Dusseldorf, Germany in 1945, three months after the end of the Second World War in Europe. He grew up in an ancient city that had been largely destroyed by years of Allied bombing, a city captured by Allied military forces (primarily American) and was under the control of Allied (primarily British) military governors. Growing up under those conditions, it’s probably not surprising that Wenders developed a fascination for American hardboiled detective fiction. Dashiell Hammett, Raymond Chandler, James M. Cain. You had to be hardboiled to make a life out of the chaos of post-war Dusseldorf. Wenders initially intended to follow in the footsteps of his father, a surgeon. He attended a year of medical school, before dropping out to study philosophy. He then abandoned philosophy in order to move to Paris and become a painter. Painting didn’t work out, so he applied to the Institut des Hautes Etudes Cinématographiques, France’s national film school. He applied, but never attended; Wenders failed the entrance exam. He found work as a film reviewer for a number of small publications, before eventually returning to Germany. There he successfully enrolled in the Hochschule für Fernsehen und Film München, a Munich film school. 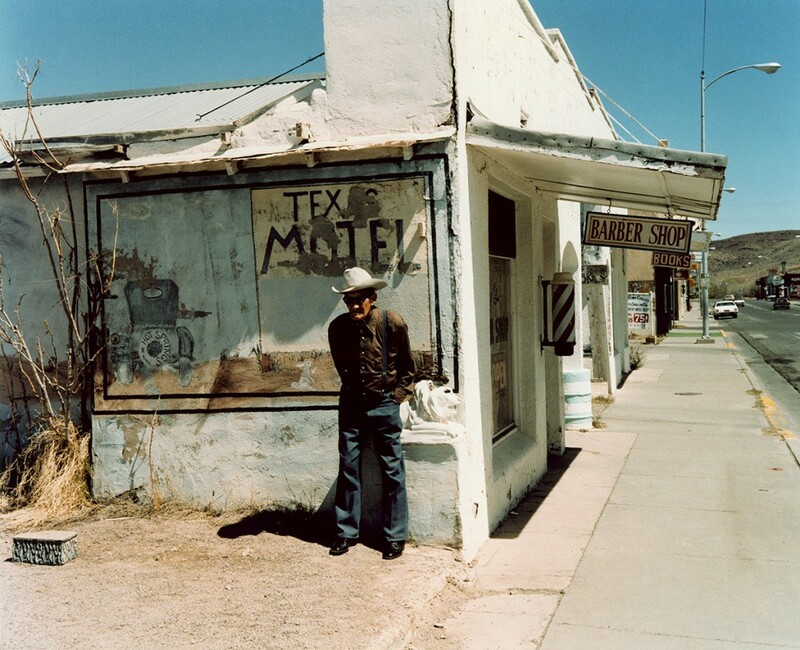 In 1972, at the age of 27, Wenders decided to visit the United States. He didn’t come to the U.S. to see Manhattan, or Los Angeles, or Miami, or any of the usual destinations sought out by young European tourists. No, Wenders came to America to see Butte, Montana. Why Butte? Because it was the setting of his favorite detective novel: Dashiell Hammett’s Red Harvest, published in 1927. In the novel, the town is called Personville, though its fictional inhabitants called ‘Poisonville.’ Butte is an old working class mining town of fewer than 35,000 people – and it turned out to be exactly what Wenders hoped it would be. 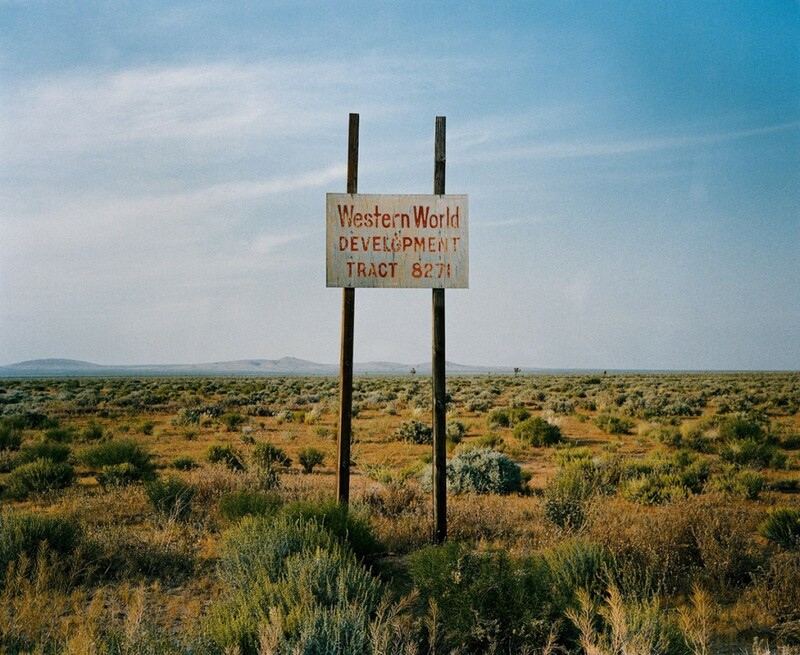 So began Wenders’ romance with the American West. That romance reached its peak when he visited the Southwest to film Paris, Texas. In 1983 Wenders began scouting locations for the movie. He often traveled alone, with a pair of cameras – a 35mm Leica to shoot images for possible filming locations, and a medium format camera – a Plaubel Makina 6×7 – which he used for his own personal photography. 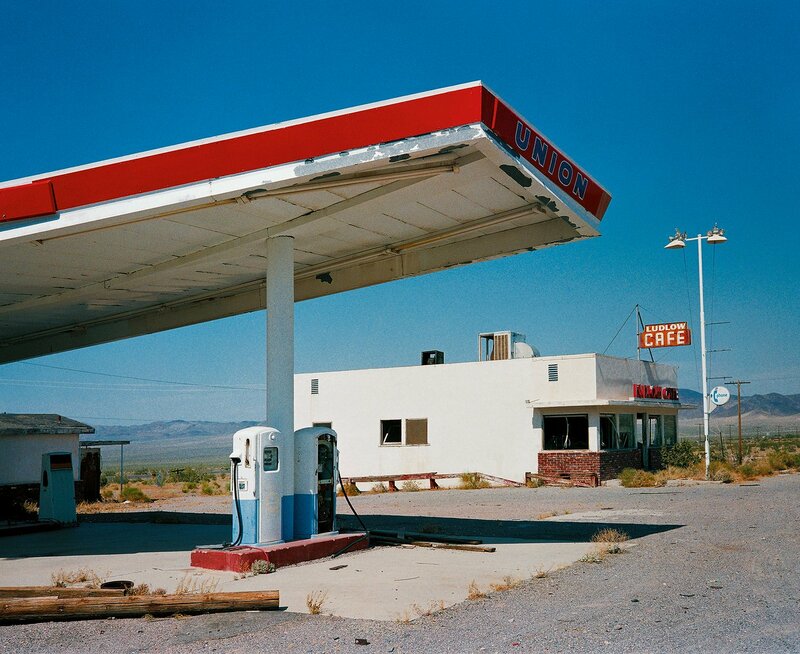 In 1986, a year after Paris, Texas was released, Wenders exhibited his personal photographs in a gallery printed and exhibited at the Pompidou Centre in Paris. In 2000 those photos were published as a book – Written in the West. A couple of weeks ago Wenders re-released that book, with some additional photos. The new work was shot with a Fuji 6×4.5 camera (he’d broken his Makina). The new version is called Written in the West, Revisited. 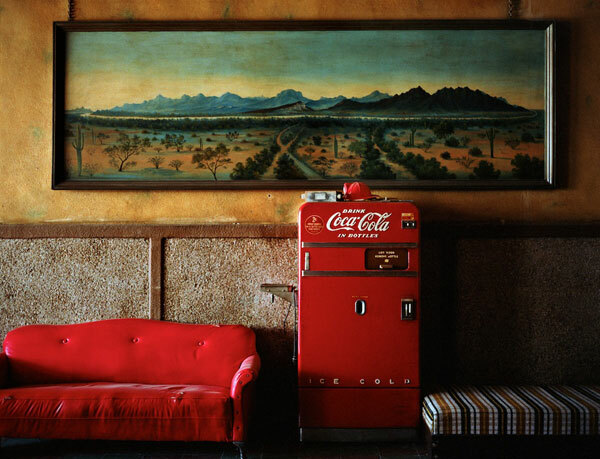 You don’t have to have seen Paris, Texas to appreciate and enjoy the photographs. But the film and the photobook are (if you’ll forgive the cliché) two sides of the same coin. They’re different facets of the same photographic vision. You could take individual frames from the movie and they’d fit perfectly with the photobook – not simply because many of them were shot in the same places, but because they share the same visual and emotional aesthetic. What I find interesting, though, is that while Paris, Texas and Written in the West share the same aesthetic, they were shot with an entirely different philosophical approach (not surprising, given that Wenders studied philosophy), The difference, of course, is that a film is a structured narrative, whereas still photography, at best, can only offer the hint of a narrative. The power of still photography lies in its ability to imply. I love photography because I’m not the one who’s telling the story, I’m just listening to it. I think of my camera as a listening device. There’s a deep sense of longing in these photographs. A sense of things caught in the act of disappearing – or have already disappeared in spirit – things that perhaps ought to be missed once they’re gone, but probably won’t be. There’s a sense of resigned isolation. My impression is that’s also what Wenders must feel as he shoots the photographs. He’s often stated her prefers to work alone when he’s shooting. No assistant to haul his cameras or gear; he carries everything he needs himself. And actually, if I’m not alone, I don’t take pictures. The basic thing I’m after, to abandon myself and immerse myself in the place, you can’t do that with somebody else around. You see very few people in Wenders’ photographs. He feels if there’s a person in the frame, the viewer’s attention is always going to be focused on the person. He wants the attention to be on the land, and the ultimately ephemeral effect of humanity on the land. All photography is grounded in time, of course. The length of time it takes to shoot the photo, and the fact that every photograph ever made is a photograph of the past. But few photographers are as conscious to the passage of time. 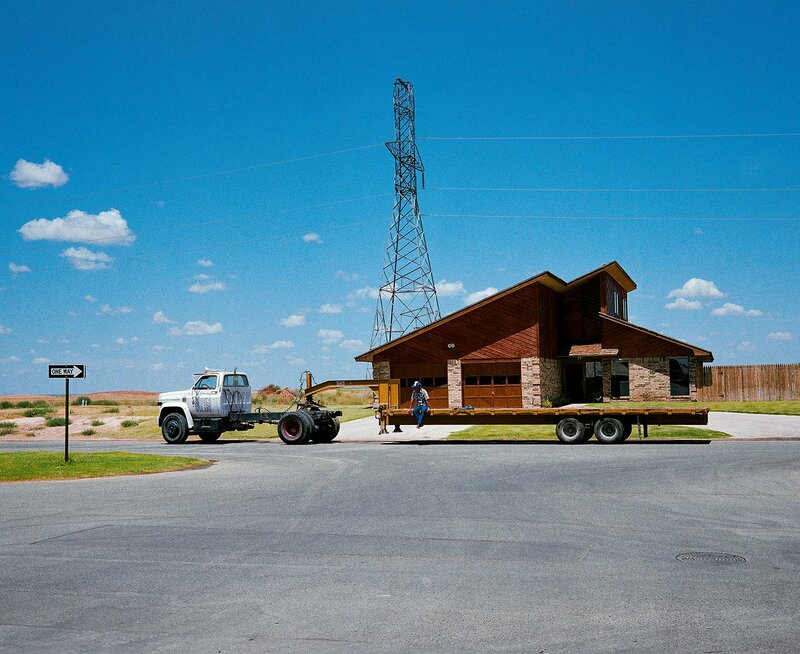 That’s one of the reasons Wenders is fascinated about the American Southwest – the towns that are slowly dying, the businesses that have gone toes up, the bones of failed communities. Places can speak very eloquently of world history. As long as you’re ready to wait and see. Places don’t necessarily open up right away. Sometimes you have to be patient until you earn their trust. Only then I can do justice to them and produce a good portrait of them. And that’s the least thing I owe them. Wenders has a peculiar sensitivity to the effects of time. Time is unimaginably big, and Wenders’ photography hints at its enormity. During his film critic days, Wenders wrote that films about America “should be composed entirely of long and wide shots, as music about America already is.” He doesn’t always follow his own dictum in his films or in his photography. He doesn’t shoot only long, wide shots. But all of his work, cinematic or photography, almost universally has a long, wide feel. They’re long and wide in a sort of spiritual way. I recently rewatched Paris, Texas. It was my third time. The plot doesn’t hold up quite as well, but my appreciation for the cinematography has magnified. I’d love to see that film without dialog, without any ambient sound, with nothing but the magnificent Ry Cooder soundtrack (based on Blind Willie Johnson’s Dark Was the Night, Cold Was the Ground). The photography is all you need. For me, it’s a matter of seeing these places and trying to read their story. You have this one moment and it tells you something about the past – very often a lot about the past, the people who passed through, who lived there, who dreamed there. Wenders could be talking about Paris, Texas. Or about Written in the West, Revisited. It applies to both.